The "dump1090-mutability_1.15~dev" is development version of dump1090-mutability, and has many additional functionality. It is preferred & installed by lot of users. However there is no .deb package available for installation, and one has to built it from the source code. (c) Install dump1090-mutability (Steps 1 to 10). 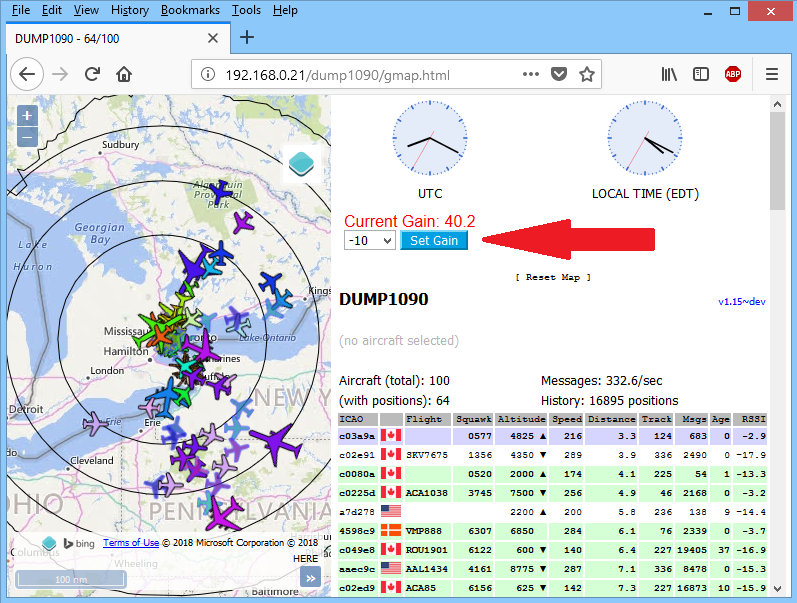 (d) Install data feeders FR24, Flightaware, & Planefinder (Steps 11, 12, & 13). It is important that first dump1090-mutability is installed, and data feeders are installed after dump1090-mutability has been installed. Below is a step-by-step method to built & install dump1090-mutability_1.15~dev from source code, and then steps to install data feeders FR24, FA, and PF. Note: This is a lengthy process, and seems to freez at several occasions. Please be patient. For most settings, accept default settings by pressing "Enter". (d) Interface address to bind to (blank for all interfaces): remove default 127.0.0.1 and leave blank. In Raspbian Stretch dump1090-mutability doed not provide output data. "Problem fetching data from dump1090." Dump1090-mutability v1.15~dev can display terrain limit rings using data obtained from the website http://www.heywhatsthat.com. What is the Maximum Range I can Get? 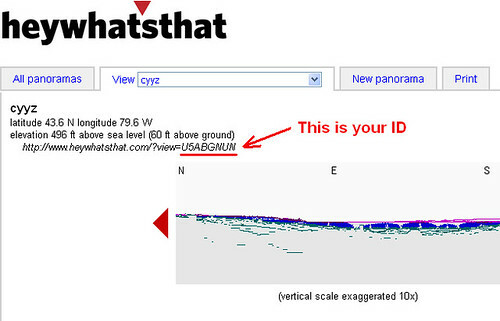 (b) Once your panorama is generated, look near the top left of your newly created panorama page. You will see URL of your panorama there. The URL will be http://www.heywhatsthat.com/?view=XXXXXXXX where XXXXXXXX is the ID for your panorama. (c) Use following command to download the generated panorama's JSON file "upintheair.json" to your RPi, and save it in the folder "/usr/share/dump1090-mutability/html"
(replace XXXXXXXX in the command below by your panorama's ID). sudo wget -O /usr/share/dump1090-mutability/html/upintheair.json "http://www.heywhatsthat.com/api/upintheair.json?id=XXXXXXXX&refraction=0.25&alts=12192"
You can create as many rings as you want by adding elevations (in meters) at the end of URL given in the wget command above after "&alts=", separated by commas. Hence if you want to add all the 5 elevation rings noted above, the string at the end of wget URL will become "&alts=3048,6096,7620,9144,12192"
To keep map un-cluttered, I have used only 2 rings in the wget command above. i.e. the 10,000 feet (3048 meters), and 40,000 feet (12192 meters). Use altitude in meters in the wget URL above. Range Circle default unit is nm (metric=false). To change to km, change "metric=false" to "metric=true"
Press ctrl+w, type Metric = false , then press Enter key. The cursor will jump to Metric = false; change false to true as shown in red. 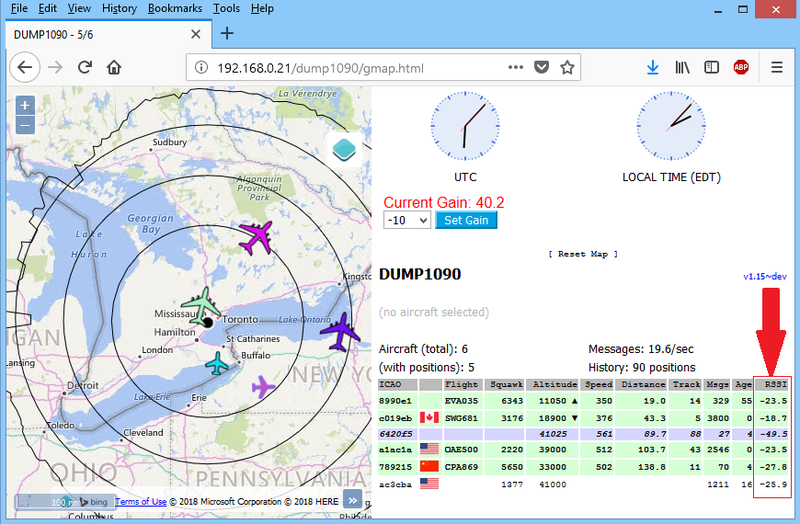 During above command, it will present a signup wizard, asking for email, sharing key, latitude, longitude, antenna height etc. Choose receiver " 4 - ModeS Beast (USB/Network)"
The FR24 Feeder can be configured on the page http://<IP of RPi>:8754/settings.html. The "Receiver" and "Host/IP" setting should be either "ModeS Beast(TCP), 127.0.0.1:30005" or "AVR(TCP), 127.0.0.1:30002" as shown in screenshots below. Last edited by abcd567; 2019-01-20 at 00:56. "Problem fetching data from dump1090. The displayed map data will be out of date." I am new to all of this and I have the stock FR software running on Pi2. Do I need to modify my FR24 Feeder Settings? #make a copy of script.js by the name script_orig.js before modifications. #this way you will have a backup copy in case somrthing goes wrong. Make changes as shown in red below, save the file and exit the editor. Reload the Browser to see map with colored circles. Last edited by abcd567; 2017-07-25 at 17:12. So after reboot lighttpd did not run as it did before. Checking the status shows that its running and normal. Reinstalled and still had no success in getting the pages to load. Ran the configuration for dump1090 and added --net --net-http-port 8080.
i dont see flags on mine, how can be added? mine is old Model B 1 so it only shows DUMP1090. im next to purchase some RPi3 to play with them and add more locations. Last edited by dedicados; 2016-05-31 at 12:38. This method is for dump1090-mutability ver 1.15~dev. Only Step-1 is different for Jessie and Stretch, rest is same. 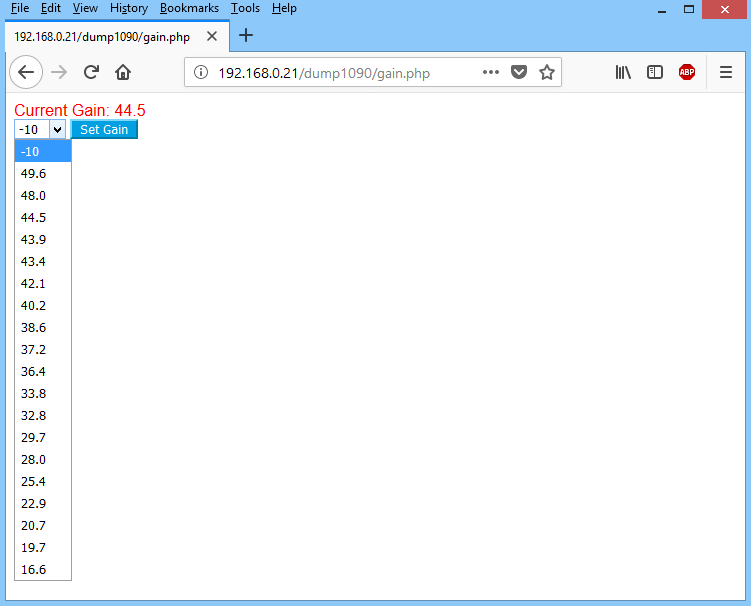 Create a new file gain.php containing gain button, drop-down list of gains & current gain display. NOTE:Code is larger than displayed. Scroll Right and Scroll Down to see these in full. The code in file setgain.sh was originally written by abcd567, but due to a security issue, it has been re-written by wiedehopf. # will display it on map as "Current Gain"
Save (Ctrl+o) and Close (Ctrl+x) the file. 5.1 - Reboot Pi for cron to run the script setgain.sh at startup. 5.2 - After Pi has rebooted, go to page IP-of-PI/dump1090/gain.php and check gain setting add-on appears as shown in FIRST screenshot above. The value show in Red at browser load or re-load is your current gain value. If you want to change it, click open drop-down menu, select the desired gain and click "Set Gain" button. After about 5 seconds, the Current Gain (red) will be updated. If you want to verify that gain has actually changed, give following command. The output of this command will show the actual value of gain used. Edit file gmap.html and add code to embed newly created file gain.php (the file gain.php contains "Set Gain" button & drop-down menu). 6.1 - BEFORE EDITING, make its backup copy. This will enable you to revert in case something goes wrong. 6.3 - Press Ctrl+w then type sudo_buttons then press Enter key. Last edited by abcd567; 2018-10-14 at 20:26. This will open file script.js for editing. The cursor will jump to line //Add terrain-limit rings. Go to web browser open & refresh gmap.html pge, and range rings will appear in different colors. A glance on RSSI Colums will show what are strengths of signals from different planes. This will help in determining if Gain Setting of dongle is to be lowered or increased. Press Ctrl+w keys, type onclick="sortBy then Press Enter key. The cursor will jump to relevant block of code. 2.3 - Add sort functionality to RSSI column (clicking on the title of the RSSI column will sort it "highest to lowest"/"lowest to highest" values. Thanks to @thutson for this. This line is blank. Do nothing here. 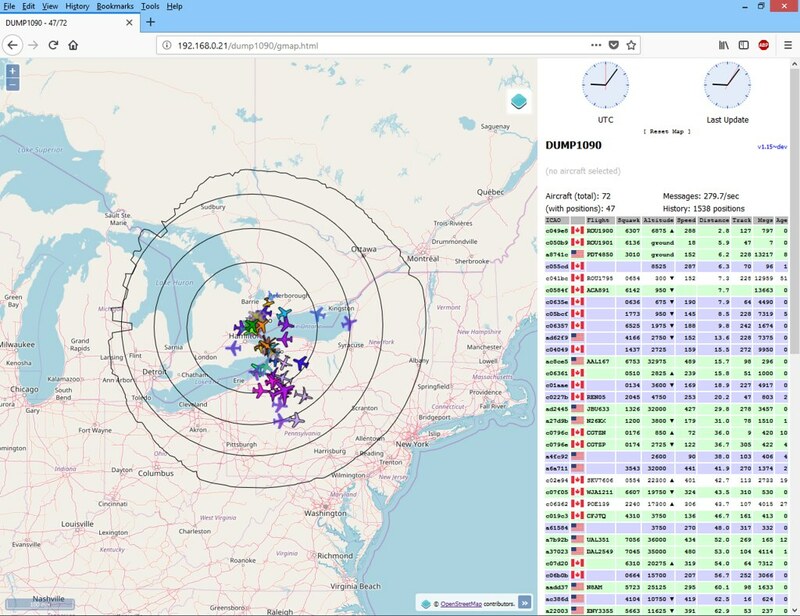 The RSSI Column will show on extreme-right of the Map page/Aircraft Table. Last edited by abcd567; 2018-11-25 at 00:16.